Do you want to know when the "economic collapse" is going to happen? Just open up your eyes and take a look. 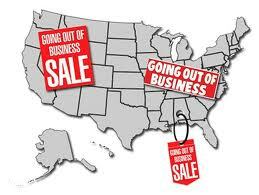 The "economic collapse" is already happening all around us. So many people talk about the coming economic collapse as if it is some massively hyped event that they will be able to point to on the calendar, and a lot of writers spend a lot of time speculating about exactly when it will happen. But as I have written about before, the economic collapse is not a single event. The economic collapse has been happening, it is happening right now, and it will be getting a lot worse. Yes, there will be moments of great crisis. We saw one of those "waves" back in 2008 and another "wave" is rapidly approaching. But all of the waves are part of a process that is continually unfolding. Over the past 40 years, the United States and Europe have piled up the greatest mountain of debt in the history of the world, and now a tremendous amount of pain is heading our way. Economic conditions in the United States and Europe have already deteriorated badly and they are going to continue to deteriorate. Nothing is going to stop what is coming. "I just don't know what you are talking about. Where I live everything is just fine. The malls are packed, the restaurants are full and everybody I know is going on vacation this summer. Personally, I am doing great. I just bought a 60 inch television and a new boat. Every year all the 'doom and gloom' types such as yourself proclaim that an economic collapse is right around the corner but it never happens. And you know what? It is not going to happen. Those in charge know what they are doing and America has the greatest economy on earth. We have overcome challenges before and we will be able to handle whatever comes this time. Your lack of faith in America and in the American people astounds me. Everything is going to be just fine, so why don't you just *************************************." person receives benefits from the federal government. Back in 1983, that number was below 30 percent. I would like to know it the group "The wakeup project" that is at Paltalk is related to this site. Since I don't see any link from you to this room and listening to what some people are saying there I wanted more information.